Outside of Cuba, it is not that uncommon for casual observers to attribute the African elements of Afro Cuban music to the Yoruba even when other roots are present. In addition to the music of the Yoruba, one of the most important of those roots in Cuba is the music of the Arará, who came from what was once Dahomey (much of which is now Benin). 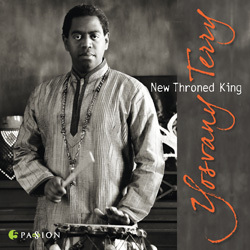 New Throned King is a fascinating, intense blend of Arará cantos and Jazz, using Arará languages (the name of his project for this recording, Ye-De Gbe, is in Fon for example) for the vocals and traditional Arará percussion instruments. This would have been an interesting project even if it had been a simple folkloric project, as Arará rhythms are intricate, and the cantos are very powerful The addition of the Jazz contributions of Yosvany Terry on saxophones and Osmany Paredes and Jason Moran on piano take this music to another level. Some of the cantos themselves will be familiar to listeners who have heard the music used in toques, but the percussion will be new to most listeners, and the final structure of these pieces is truly unique. New Throned King was nominated for a GRAMMY in 2015 (Best Latin Jazz Album) and a Cubadisco in 2015 (Jazz Cubano).